404 pages | 1 B/W Illus. 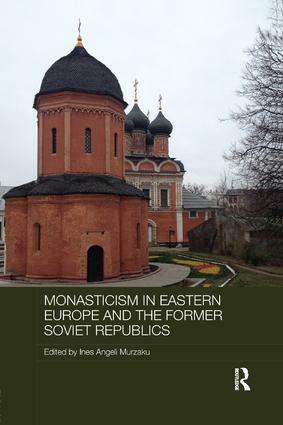 This book looks at Eastern and Western monasticism’s continuous and intensive interactions with society in Eastern Europe, Russia and the Former Soviet Republics. It discusses the role monastics played in fostering national identities, as well as the potentiality of monasteries and religious orders to be vehicles of ecumenism and inter-religious dialogue within and beyond national boundaries. Using a country-specific analysis, the book highlights the monastic tradition and monastic establishments. It addresses gaps in the academic study of religion in Eastern European and Russian historiography and looks at the role of monasticism as a cultural and national identity forming determinant in the region. "Professor Murzaku fills a significant void in her recent marvelous collection of essays on the role of monasticism in Eastern Europe and the former Soviet states…Monasticism in Eastern Europe and the Former Soviet Republics is a must have for scholars in the area…I know of no other work available in English that details monasticism in ECE and FSR in an inter-disciplinary forum with attention to both Orthodox and Catholic expressions of monastic life… All theological and university libraries ought to have a copy for reference, in addition to those who research and teach in the areas of Eastern Christianity, ecumenism, spirituality and ecclesiology…I highly recommend this text." Ines Angeli Murzaku is Professor of Ecclesiastical History and Founding Chair of the Department of Catholic Studies, Seton Hall University.